A hot tub can be a relaxing spot to unwind after a long day, and it can also be a place to have some much-needed fun over the weekend. The best part of owning a hot tub is that it’s great for taking out some me-time. If you like being by yourself, a soak in the hot tub can help you relax, take away your tensions and recharge your mind, body, and soul. If you are the outgoing and party type, you can invite your friends and family members to join in the fun of soaking in a hot tub, too! Installing a hot tub can be a complicated task that should not be attempted without expert supervision. 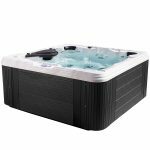 If you are thinking about building a hot tub in your backyard or installing a prefabricated hot tub, the question of price must have crossed your mind. Given that hot tubs require a combination of electrical fittings, plumbing, and construction, it can be pretty expensive to build a hot tub. Of course, you can buy a prefabricated shell that is easier to install but also requires assistance from a certified electrician and a plumber. 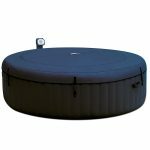 Inflatable hot tubs, on the other hand, are plug-and-play that only needs an electrician’s inputs if you are buying a 220v hot tub.